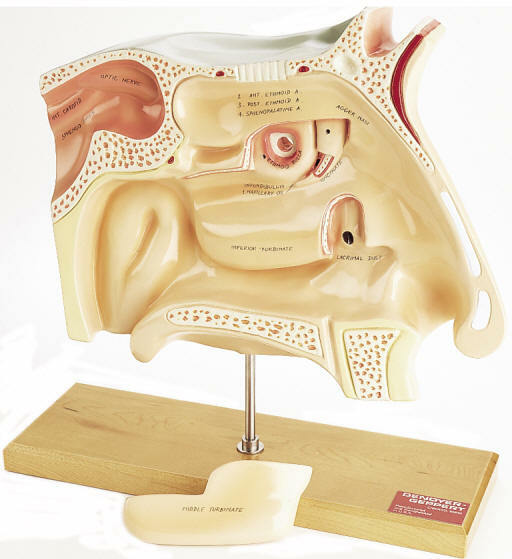 Cutaway model depicts a near median section through the nose and nasal passages. Details include nasal cavity, soft and hard palate, uvula, eustachian tube and pharyngeal tonsil. Back side shows ethmoid and maxillary sinus cavities. Removable patient education card and base. 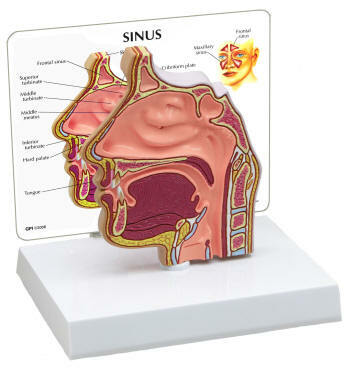 Developed to demonstrate the endoscopic procedure performed by surgeons, this 4 times life-size anatomical model of the sinuses shows all the sinus cavities. A removable middle turbinate reveals a partially dissected uncinate, the infundibulum and the ethmoid bulla. 18 labeled parts.